Oh my goodness…. I have an OBSESSION with this Eclair cake. It is absolutely DIVINE! And guess what? !..it is SO simple to make! It does need to refrigerate it over night, so plan accordingly. This is my go to recipe for parties and get togethers. Everyone ALWAYS asks for the recipe… well, I am going to let you in on the secret so you can impress your friends and family, too! Microwave butter and milk just enough so that they are melted together. You do not need to boil it. Add cocoa and powdered sugar and blend together. This will be a runnier frosting/glaze. Pour over top of graham crackers and smooth out nicely. How did I miss this before? LOVE eclairs so I know I would love this. Thank you! Sorry about that! I have updated it. 12 oz. cool whip. I live in Australia. Can't find Graham's crackers. What can I use as a substitute? A digestive biscuit may work or something similar that is square would be best. An Australian equivalent for Graham crackers would be Arnotts Lattice Biscuits. The closest thing you will find is Arnott's Granita biscuit. Or the English Digestives. Problem is, they are significantly less sweet. Hi Lorna - Are those the baby biscuits? I used to travel to London quite a bit and thought those were close in flavor to our graham crackers! Cool whip is, basically just pre-made whipped cream. I'm sure you can substitute your own whipped cream. The recipe stated Vanilla instant pudding, not "Vanilla Instant Whip". Do you have vanilla pudding there? Look up a recipe for it if you don't have the instant packaged puddings that we have. There are several posts for cracker alternatives. Good luck. Lorna Doone cookie's work really well,they don't get soggy and tatse great . A good substitute if you cant find graham cracker's or if you need to hold it for a longer time! Cool Whip is a non dairy whipped topping. It is found in the freezer section. I am sure there are substitutes wherever you live! Cool Whip is the name brand of whipped cream, comes in a bowl-shaped container in the cooler section of the grocery dept. Cool Whip is imitation whipped cream using mainly hydrogenated oils and corn syrup. In my opinion it's nasty. Use real whipped cream if you can. I found this in regards to Graham cracker substitute ------ I trusted Valli, however, and tested the recipe myself. When I brought home two packages of digestive biscuits – one coated in dark chocolate, the other plain – I quickly opened them and gave the biscuits a nibble. Hm. Oh yes, they could be used like graham crackers! They do actually taste similar! They weren’t icky and weird at all! And right there on the box was a disclaimer that these biscuits do not aid in digestion in any way whatsoever! My grandmother made this recipe for years with nilla wafers. She also added sliced bananas--and at times we make with chocolate or banana pudding--I have also added amaretto and sprinkled almonds at times. Do you have vanilla wafers? They would be a great substitute for the graham crackers. Real Whipping Cream? I figure I can use Arnotts Granita Biscuits as they are still available in Australia and perhaps Vanilla instant pudding? (Not sure if that one is still available.) A lot of different products here in Australia have been subsituted over the years by companies which don't make our original recipes.................. :( They are nothing like the original ones. Sadly some recipes call for products we don't have anymore. The chocolate eclair looks lovely. In Australia we don't have Graham crackers and cool whip. What are they and do they have an alternative please. I live in Australia and whilst I know our substitute for Graham Crackers which is Granita or Digestive biscuits, I don't know what Cool whip is. I would like to make this recipe so would be obliged if somebody could tell me what this ingredient is please. Just to clarify for our friends not from the US. Cool Whip is a non-dairy whip cream replacement which comes frozen in a tub. Real, especially fresh, whipped cream will taste better. Cool Whip is great for folks who cannot tolerate dairy products. Vanilla Instant pudding is pudding you don't have to cook. You can substitute any pudding you prefer. It's basically whipped cream and pudding folded together. I think this recipe would work well with homemade shortbread to replace the graham crackers, too, IMHO. Also, you can make a great glaze using semi-sweet chocolate chips and cream. Melt chocolate while adding cream a little at a time until you get the consistency you like this is the easiest way to make ganasche. Can you tell me what cool whip is equal to. I am in Australia. Vanilla wafers are too thick..
Joanne, If you haven't already found an alternative; You could use short bread cookies. whipped cream is what cool whip is. Do you have to use whole milk? Or could you substitute with low fat? Looks super delicious, but I am diabetic. I will try this with half 'n half, as it has no sugar, sugar-free cool whip, and I'm thinking of maybe just using Splenda rather than powdered sugar, or maybe mix them up. Smucker's has sugar-free chocolate topping or else I may try the canned sugar-free frosting. I don't think there are sugar-free or low-sugar grahams, but I will look. Splenda is a sweetener, substitute for sugar. It is NOT the same as powdered sugar, which is simply sugar that has been ground so fine that it has the appearance similar to flour or talcum powder. Powdered sugar is used to make frostings and icings, is used to coat the surface of doughnuts and cookies like Russian teacakes and Danish wedding cookies. Also used to sprinkle on surface of cakes as decoration, sifted onto French toast and crepes, lots and lots of other delicious uses. We call powdered sugar Icing Sugar because it looks so fine almost like Talcum Powder and excessively sweet. I have made this recipe using Splenda and not powdered sugar and the icing comes out great! In fact Splenda makes both Sugar and Brown Sugar substitutes and even provides conversions as you use less then the regular stuff. As for the Graham crackers, I have yet found any that are low sugar. I love this dessert. It's even better with French vanilla pudding! I like French vanilla best also. I normally would never use instant pudding (as opposed to cooked) or a non-dairy whipped cream substitute, but they are great in this. I can't imagine this tasting better with vanilla wafers or Lorna Doones though. It's not supposed to stay crisp, but I realize tastes differ. This is a crowd pleaser. I have a recipe very similar to this that has been a family favorite for about 20 years.. You're right... it's extremely easy and pretty much everyone who has it, loves it! In fact, my 25 year-old son just asked for this for his birthday dessert last week. :). Just wanted to thank you for this recipe! I am famous for not being able to cook or bake anything, but I made this for Thanksgiving and it was everyone's favorite. I will definitely be making it for Christmas. It was so easy and super delicious. It tastes exactly like an eclair! I use this all the time, too! Love it! The only difference is we use French Vanilla pudding instead of the regular vanilla. I think it gives it a richer flavor. I made this for an evening dinner group we belong to, and it was totally delicious! Thinking of making it for Easter dinner. Well, I am totally blaming you for my new evening addiction. We made this for Easter dessert and I have been sneaking a piece each night after dinner ever since! It is so good! I should have taken your advice and doubled the chocolate topping. I think it would be even more yummy with a thicker topping. Thanks so much for sharing such a simple and devine dessert! This recipe is delicious. My family loved this dessert. It was so creamy and full of flavor. My only complaint is that I covered it with aluminum foil when I put it in the refrigerator and some of the chocolate stuck to the foil. Other than that this was an amazing simple dessert. Thank you for another recipe that my family loves. Try spraying the aluminum foil with cooking spray. Shouldn't stick then! This is very easy to make and delicious . I used a homebrand cracker biscuit ( the type you would put cheese on) and it was fine. Not sweet and added a nice crunch. Coolwhip was replaced with whipped cream that was stabilised . I will pass this recipe around . My frosting did not come out like yours looks. It was very runny and did not thicken up at all. Any ideas what I did wrong? It was very tasty just not the thickness it should of been. OMGoodness! I"ll be making this one really soon! If you are allergic to milk could you use Almond Mild or another substitute? Unfortunately, the pudding won't set with almond milk. I can't have dairy, and have tried to make pudding with almond milk. 7 pages to get a recipe is stupid!! I apologize. My last print plug in is no longer available and I am working hard and fast to get another one installed. If you just copy and paste the recipe into a word doc, you can bypass printing the comments. Hoping to get this issue resolved asap. Thanks for your patience. We have a similar family recipe but ours has cream cheese with the pudding, milk and cool ship. Can you please tell me what cool whip is I live in Scotland and in thinking it must be whipped cream? What is a cool whip? I love cream cheese! Can you share your recipe? Thanks. cool whip is a brand of fake whipped cream. best avoided. Yes, please share the recipe with cream cheese. That would make it extra delicious. Thanks! The advantage of using the Cool Whip is that it comes frozen, ready to use. All you have to do is thaw and use. That is part of what makes the recipe easy and fast. Cool Whip is chemical fake whipped cream. Use the real stuff for health and for taste. Melissa & Bree, I have lived in UK & Australia & have found that a product usually available in continental delis or wherever they sell imported foods in Oz & everywhere in UK called Angel Delight is equivalent to Cool Whip. Whipping cream and sugar for cool whip and digestive biscuits or wheatmeal biscuits. Try McVitie’s Original Digestive instead of graham crackers. Cool Whip is a low calorie whipped cream substitute, but has a sturdier structure. You could used whipping cream--you need to whip until stiff, then fold in to the pudding for this recipe...I think that would work. Can this be frozen after it is made? I made this in a 13x9 pan and it's sitting in the fridge. I just wanted to say I followed the recipe to a T except using French Vanilla pudding and I must say the Cool Whip/Pudding mixture seemed to be waaaay too much. The picture shows a nicely proportioned cake. I used the cool whip mixture as directed and my cake is all the way to the top of the 13x9x2 pan. I don't get it. AND I didn't even use all the mixture! I think next time I'll either use a cup or so less mixture or maybe even use a 15x10 pan. I have a feeling I'll be wiping a whole lot of mixture off these pieces when I go to eat them. I love the way the cake is proportioned in the picture though. Mine didn't turn out so nice and flat. This shows to be about an inch high; mine is 2+ inches like I said. I would love to use a graham cracker alternative, like something light and flakey. Any suggestions? Of course with something lighter, the cool whip mixture will be too heavy so there'd have to be a little lighter alternative to that as well. Maybe something like a whipped cream filling. But then we're talking a whole different recipe at this point, aren't we? Lol! Ok, I tried it today. DELICIOUS! The cake settled a bit and the graham crackers softened immensely. I'm sorry. I should've saved my comments until after I tried it, not while it was sitting in the fridge!! Thanks Nikki! Thanks for a great, easy, and delicious dessert. I took it to church and it was a huge hit! I'm going to check out your other recipes! Thanks again! WOW this looks absolutely amazing. A version for Australian bakers would be fantastic.. Graham Crackers, Cool Whip and Instant pudding mixes are something we cannot readily get here. Or if we can, certainly not where I live in rural Victoria. Hi Teena! I wish I could be more help, but I currently do not know any substitutes that work from experience. Maybe someone who makes this can help or comment when they find out compatible ingredients. You could try googling it too, maybe there will be some good alternative. Again, I am so sorry I can't be much help on substitutes. If you find some, keep me posted! Re: cool whip - what can I sub with? 1. In a very small saucepan, sprinkle gelatin over water and let stand for about 5 minutes to soften. 2.Heat gelatin mixture over low heat until gelatin is dissolved, then remove from heat. Let it cool. 3. Beat cream in a well-chilled bowl. 4.Slowly add the icing sugar and vanilla to the whipped cream and whip until slightly stiff. 5.Add melted and cooled gelatin to the whipping cream Continue whipping until cream holds its shape. Tried this recipe but it the pudding mix did not set. Very tasty but could not cut into squares and serve. I am sorry this happened. Did it sit in the fridge long enough? Did you use instant pudding mix? Also, the pudding never completely sets to a hard consistency, it just firms up a bit to hold shape. I am sorry it was not able to cut nicely. Hopefully it works better for you next time. Hi, as I said previously in another comment if you are in UK or Australia you could try Angel Delight instead of Cool Whip (available most places that sell imported foods in Oz) & Arnotts Granita or Lattice biscuits instead of Graham Crackers. Sorry I meant Dream Topping not Angel Delight which is an instant pudding! This sounds like it will work well, and it may also help the filling layers to hold their shape better because of the gelatin. Thank you for sharing! I just came across your Eclair Cake recipe, it looks delish! I want to make my own vanilla pudding & whip my own cream for the filling, I'm sure this will work fine. Olivia & Teena, you can sub cool whip for whipping cream & sugar & you can make your own vanilla pudding. You can even make your own graham crackers. I know this wouldn't be convenient as packaged. But, it is an option. Here is a recipe for graham crackers (I've not made these, I'm sure they're good). This looks delicious! I don't like to use Cool Whip because of the ingredients in it, could real whipped cream be used instead? I hate cool whip and have always used "real" whipping cream with a little bit of real vanilla extract to it. Just as yummy, if not yummier! Can you use whipped cream instead? I don't know...never was a big Cool Whip fan. Recipe looks delicious! This is a really good recipe.....I have been making this for at least 20 years...my family loves it...and if we are dieting it is also good using low fat ingredients. I LOVE this recipe. I remember making it years ago. So yummy! Hi Nikki, This looks amazing! I pinned it for later. I can't wait to try it I love eclairs! Hope all is well. Use French vanilla pudding with 3 cups milk and the cool whip. Also, use chocolate graham crackers. Make a ganache with bittersweet chocolate and pour over top. Absolutely fabulous! i have made this without powdered sugar and you don't miss it. I also use the cinnamon graham crackers and it gives it better flavor to any kind of pudding. I have used chocolate and vanilla with the cinnamon. Just a FYI. Your picture makes me want some but i would have to go to the store for the cool whip and crackers. I've made this for years as well, but I've always layered with blueberry or cherry pie filling. Are we not going to cook the mixture of milk and instant pudding in this recipe? Is it ok to do that? For the chocolate topping, you can get the Smuckers hard she'll chocolate....Shake well, put in microwave (with top off) for few seconds, pour over pudding mixture. Can't remember if it takes two bottles....very good, everyone always wants recipe. Hi there, can I substitute cool whip with actual whipped cream? We don't have cool whip where I'm from. can i double boil the butter and milk instead of microwave? In England Digestive Bisquits are the same as Graham Crackers. Cool whip is a prepared whipping cream like substance with little or no calories. When you indicate 2 packages of Grahman Crackers do you mean 2 sleeves or 2 boxes? I have a box of 3 sleeves that says 14oz and I am confused. Thanks..
im in Australia and i dont know what these graham crackers are ,. Can you explain or give me an alternative please. This looks like a very delish recipe and i want to make it. Thanks. Hello. Thanks for this recipe. I'm from Czech Republic and I don't understand, what is "cool whip". I cann't translate it. Can you help me please and explain to me, what is it? Thank you. Cool Whip is a whipped cream substitute. Try using whipping cream--whipped until stiff--then fold into pudding. Like the taste, but it never firmed up, Could eat it with a spoon.. Will not serve this to my guests. Very soft. I am sorry yours never firmed up. Did you whisk the pudding and milk until the pudding formed? Did you use instant pudding? This recipe was very disappointing. There must be some mistake in the frosting, was like water, so before pouring over cake i added 1 full cup of icing sugar to mixture. Was still way too runny, so added yet another 1/2 cup. against my better judgement poured it over cake and let it stand overnight. made no difference. cut it for dessert, after 1st piece was removed the frosting ran everywhere...what a mess. If i chose to make again i will find my own frosting recipe. I am sorry you had trouble with this recipe. I just add more powdered sugar as necessary to get a thicker frosting consistency. It is supposed to be on the runnier side, but it does set up in the fridge. I FOUND OUT WHAT IS WRONG. THE SUGAR FREE PUDDING COMING IN DIFFERENT SIZES THAN THE REGULAR. Please make things easier for people who MUST use the sugar-free puddings, such as diabetics or dieters. State the sizes for both boxes, sugar-free boxes differ than regular pudding mixes. OR you can just state Large box or Small box, since both types come in just the two sizes....I used the Large but I have not yet tasted it to tell you if the Small would have been better. However, mine has a much truer vanilla pudding color to it, as opposed to the whiter lokking one that your picture shows....I'm sure either version will be good. I, too, had a problem with runny frosting. Luckily, I made a "practice" cake to cut into and that will tell me if wasted my time and ingredients, or if I will be able to just add a frosting to make it look more appealing. Where do I buy cool whip? What's cool whip ??? I nave never heard of it here in Australia. What do we use in place of it. Sour cream or creme fresh , or just fresh whipping cream !! Crème fraîche would probably work, or whipped cream. Somebody mentioned Dream Topping. Wtf is cool whip? Or graham crackers? We don't have these in uk! Graham crackers are like Digestive biscuits or Anotts Lattice biscuits,. Basically a plain biscuit. I'm in Australia and our products are similiar. Looks very nice your recipe. however I live in France and I don't know what Cool Whip and Graham Crackers are? What can I take in stead of that? im addicted to sugar and chocolate .cant wait to try this,tomorow im fixing. Refrigeratea small mixing bowl. Soften gelatin with 2 tsp. cool water, then add in boiling water, stirring till gelatin is completely dissolved. Cold till tepid. Place ice water and nonfat dry lowfat milk in the chilled bowl. Beat at high speed till mix forms stiff peaks. Add in sugar, still beating, then oil and gelatin. Place in freezer about 15 min then transfer to refrigerator till ready for use. Stir before using to retain creamy texture. Graham crackers can be substituted with Granita or Arnotts Lattice biscuits. can you use real whipped cream instead? I make lollie cake in the US with Graham crackers. not quite as good as Malt Biscuits but it works. I have been making this for a very long time. To make it lower fat use fat free French vanilla pudding, fat free cool whip, and reduced fat Graham crackers. Ahh this is so good! My mom has been making this recipe for decades! It's so delicious!! I wanted to say thank you for all the work you put in to supply all your followers with these lovely cake recipes. and the replies that are needed. You are really dedicated to us on this site. I will be trying this Eclair Cake and Flourless Chocolate cake soon. Keep up the good work I do appreciate it. Hi - what type of cocoa - sweetened? Unsweetened? Also, is it two 14.4 oz BOXES of graham crackers? Hi, saw your recipe and said I will have to pin it and try. Do you use honey graham cracker or just regular plain graham crackers? I guess it doesn't matter in the end. Just found this "shared" on my facebook page. 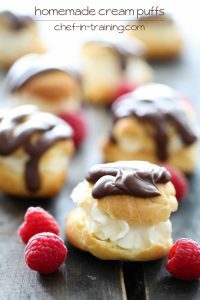 I LOVE eclairs and this looks wonderful and easy. Can't wait to try it! what can I use instead of grahams crackers? Does it matter if the cocoa is powdered or melted chocolate? Just run it under hot water for a minute before you open the bottle and spread on top!! I use this recipe but for some reason thought it had sour cream in it. I think it added a nice tang to the pudding. Could you please tell me what cool whip is? This recipe sounds easy to make and delicious. Can Cool Whip be replaced with real whipped cream? If so, I imagine more sugar would be necessary as Cool Whip is sweetened and real whipped cream is not. So how much? This sounds great! I just wonder why so many people never read the comments before asking the same question that someone else has already asked! Come on people! Read the info - its not that hard! Can someone please tell me what a "Graham biscuit" is? My mom used to mke Icebox Cake. It's made just like this except with 1 box each chocolate and vanilla pudding and no Cool Whip or frosting. She only used the pudding to "cook," not the instant pudding. Assembly is the same, except sometimes she would just crumble graham crackers between layers and cover the top with them. For an 8x8 pan, use a small box of each flavor; for a 9x13 pan, use a large box of each flavor. Hey I was wondering if I could substitute Whole Milk with 1% milk because that's all we drink in my house. Please, I'm not sure what Cool Whip is? I am from South Africa, what is Grahams crackers and what can I use as substitute? What can we replace for cool whip ?? I have been making this for more than 20 years. The frosting I make has a little more to it but it's about the same. Cinnomon grahams or chocolate are also good. I also live in Australia and I have no idea what Cool Whip is or what I can substitute with. Would cream be OK? Looks easy & delicious, but I would prefer not to use Cool Whip. Would real whipped cream work in this recipe? yes we did Mama !! lol and not instant pudding but from scratch .. :) but this sounds so much easier..
We have neither graham crackers, nor cool whip in Australia, nor am I quite sure what either is to substitute with, Any suggestions? How about Vanilla wafrs? That's what I use instead - or some shortbread cakes would also be just fine. Instead of Coll Whip, which is oil, just whip some cream. Looks yummy, just one minor misspelled word "poor" . Did you mean "pour"? I'm out in South Africa can oly whip be used as a substitute for cool whip. Yes, looking at all the comments above, Orley Whip is what I would use for this recipe. I just made it using 12 Sponge Finger biscuits cut in half and 2 tubs Vanilla Fruche instead of Cool Whip. This also brought the fat content way down. powdered sugar is broken down more than castor sugar. Whir the castor sugar in the blender or food processor until it is powdered. It is called an Ice Box cake ... my mom use to make it all the time for us as lil kids !! have not made it in yrs. ,,,, going to make one this weekend ... thanks for sharing !!!! This seems a cheat pudding as I don't like using pre packet ingredients. How do you make the vanilla whip pudding from scratch? Can you use coconut milk instead of milk?? I cannot use milk. With so many substitutes there has to be one that works. Graham crackers are usually found in the cracker area of the store..and whipped cream can be used instead of artificial cool whip. Yuck. This recoil looks divine. Thanks for sharing. Saw this posting on a friends FB and HAD to 'comment'............ I have made this cake for more years then most of the younger generation has been texting. The recipe you've posted is made using graham crackers and they do NOT taste like Eclair's (like it's suppose to)........the OLD recipe has a secret that no one EVER figures out.... And it's definitely NOT graham crackers but rather UNsalted Saltine Crackers!!!! The rest of the ingredients are the same except for using 4 cups of whole milk. Once the cake is put together and sits for at least 24 hours (this is necessary because then the saltines become soft like pastry! ), then it really DOES taste just like an eclair! Oh and buying a can of GOOD dark chocolate frosting - microwaving it until is soft enough to pour over the cake is a quick/easy topping and always what I've used since WAY back! So that's the REAL story and secret of the ECLAIR CAKE recipe!!!! ALWAYS a hit and never has anyone guessed the 'secret ingredient'! Enough to cover the bottom of the pan, times 3 for the 3 layers. Man, tough crowd here with so much nitpicking. I absolutely loved this recipe. I made it *exactly* according to the recipe. It set up,filled a 13x9 pan, cut perfectly, and was eaten up! Thank you for such a great dessert recipe! 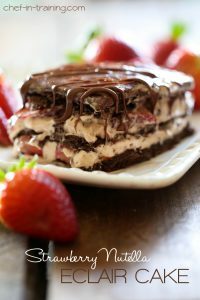 Eclair Cake: I'm sorry to say that I have tried this recipe - word for word - in my opinion and the other 4 in the family's opinion this cake is F L A T, no savor at all, it tasted like a pudding for babies! I do not advise anyone to make it unless some fruits or liquor (grand-marnier, or other) is added, it may resemble a poor brother to Tiramisu. I'm so disappointed, I had to throw most of it away. Not even close to an Eclair. Michelle B ~ Buy the smaller size box of Graham Crackers, the one with 3 packages in it (I don't know the weight). You will have enough crackers for this cake with a few crackers left over. The icing was very thick and hard to spread. I followed the recipe, but I think next time I'll add more milk. As an Australian, I don't have access to Graham Crackers or Cool Whip, so I "Aussied" it up by substituting with Sponge Finger Biscuits and Vanilla Fruche. It looks great so far. Thank you so munch! I am so glad I found your website! Mmm!! Lovely recipe! Glad I found your site! My mother-in-law used to make this for family gatherings and it was divine! I had kind of forgotten about it, until I saw this shared on a friend's FB page! I'm totally making this for my next get together w/ friends! Thank you, I have GOT to make this. I love making homemade desserts and this one sounds easy and delicious. My husband loves Eclaires, so I'm going to make this on Father's Day for him! I used White Chocolate pudding instead of Vanilla ....delish. Took to Neighborhood Assoc. Meeting. Success ! I cheat and use the "tub" frosting, (Milk Chocolate, of course) I also use French Vanilla instant Jello Pudding. Makes these a bit richer!! Looks delicious. I'd substituted the cool whip though with real cream though. You can also use Tennis Biscuits if you live in South Africa. Can you substitute vanilla wafers for graham crackers? I don't like graham cracker crusts. Every time I make this everyone devours, but it has never once sliced up like the picture with pretty layers. Usually its a gooey mess. I tried freezing it and it sliced easier but when it thawed enough to eat, it didn't hold shape. I know three other ladies who have made it and they say same thing. I am a metal worker but I cook a lot. If interested the foundry site has a cooking page in it. This recipe has great potentials BUT the ingredients listed as a HUGE disappointment. Make a cooked vanilla pudding or make your own from scratch, it's not that difficult and the final product is FAR SUPERIOR to the "instant pudding" that was recommended. Even cooked, package pudding mix will be superior to the instant. Then the use of cool whip?!?!?!?!?!? My goodness, is real whipped cream so difficult to make?!?!?!? I haven't tried this modified recipe yet, but I can guarantee it would be FAR superior to the one posted here. It is great idea, making Eclairs in a cake pan for a party of such, but let's get some decent and real ingredients, PLEASE!!!!! Your suggestions sound very delicious, but take more time to make. The advantage to the original recipe is that is easy, fast, and cheap. Anyone can make it, even if they are not a "great cook." However, I think if the two were served side by side, yours would be the clear winner on taste. I am going to give your recepies a go tfor my friend to sell in her code shop to help her through troubled times. Thank you humbly for sharing on Facebook. Please ad me to your newsletters. Do you have a recepie book I can get? Thank you Wendy. This eclair cake sounds Awsome. That's my favorite cake anyway. Can't wait till I can get everything to make it. With summer coming on the no bake part is great too, especially when we are camping. Most delicious and so easy to make. Thank you so much. I accidentally bought cook and serve pudding. I'm guessing it will be fine I just have to cook it and let it cool before I can mix in the whip and layer it? I love the recipes that is posted. Keep them coming. I dont live in the USA so have never met cool whip.....what is it? This was awesome. I used chocolate graham crackers instead and doubled the frosting recipe as the blogger suggested. It was delicious. Next time I might try it without the cool whip. Hey Nikki!! Love the recipe! Wondering if you had the nutritional information on it?? I want to make it for my father in law, but he's on a low sodium, low fat diet so I wanted to make sure he could eat it! You can check on the packages of the ingredients (graham crackers, pudding, Cool Whip, etc.) for sodium content to estimate. But I think sodium in this recipe would be almost nothing. Your recipe calls for two boxes of graham crackers. That seems like a lot. Did you mean two of the three packages from a 14.4 oz. box? Heavenly! Super easy and delicious! I live in South Africa,could you maybe advise as to a substitiute for Graham crackers and Cool whip as I can not seem to find them in our store.. I'm posting a link to this recipe on my blog this Friday. Thanks for a delicious recipe. I can't have sugar so make it with sugar free pudding and cool whip and everyone else enjoys it too! hi! wow cool recipe.thanks . wat are graham crackers? I'm from south Africa haven't heard of them.could u plz suggest a substitute.thank u. They are a sweet flat, square "cracker" (biscuit to you!) You could substitute Mari biscuits, only they are round. Do you get square vanilla wafers? What is Cool Whip? I am from South Africa, we have a product called Orly Whip, which is a non dairy cream - kept in fridge and whipped like cream. Is it something like that? A frozen whip cream like product. When I lived in South America I substituted one that was powdered and I had to add milk to and whip up. Orly whip sounds like the same thing or at least similar. I live in Aust... what are Graham Crackers please & is powdered sugar Stevia? Gloria, you can make powdered sugar by putting regular granulated sugar in a blender or food processor and pulsating or blending until it is powdered. It is mostly used for making frosting and sprinkling on donuts, cakes, cookies and so on. Powdered sugar is icing sugar. For those who don't know what Cool Whip is please use Heavy whipping cream and mix it on high speed with your mixer. (Tip: Don't whip too fast at first or you will make a mess. Go slow and gradually go faster.) It will put air into it. Add enough sugar to sweeten it. Not too much. Just taste it as you go so you are happy with the flavor. It's better than Cool Whip. I will try your recipe soon, but I love cinnamon Graham crackers, so I plan to try those as the crust. My husband loves eclairs! I will let you know what he thinks of the dessert. I also like the comment about using lemon pudding as the filling. If I make that, I think I may try ginger snap cookies as the crust. Other suggestions for crust, if you can't find Graham crackers or don't like them: How about lady fingers? or just about any kind of cookie, crushed (use your favorite kind)? Cookies may make it too sweet for some people. One person above uses saltine crackers without salt: so, how about Israeli matzah? For those who aren't familiar with it, matzah is a flat, saltine cracker-like wafer, the original "unleavened bread" for Passover. The kind I bought was plain whole wheat, no salt and no sugar, which would be a good selection for those wanting to limit their intake of those. The brand I bought is Osem, and they have many varieties, including chocolate-coated orange, raspberry, and plain. And it fits PERFECTLY into an 8" x 8" square cake pan. The Osem Company is Israel's leading exporter of kosher food to the USA. No, I am not Jewish, but I love Jewish food. Perhaps this would be easier to find than graham crackers, outside the USA. I looked up "graham flour" on Wikipedia, and it was very interesting. It is a type of wheat flour that is made by separating the various parts of the wheat seeds (also called wheatberries) before they are ground up into flour. There is some difference in the ways that the individual ingredients are milled, but I did not look at the details. After milling, the ingredients are mixed back together, in certain proportions. It mostly affects the texture and taste of the flour, as well as the shelf life. Graham crackers are a flat, crispy, cracker-like lightly sweetened cookie. I just made this tonight for Father's Day for my hubby and it was sooo yummy! I changed it a bit, i crushed the Graham crackers and mixed them with butter and sugar and layered them instead of using the whole crackers. We really loved it! Thank you so much for the recipe.i think this will be another go-to recipe for special occasions. Is there a way to replace cool whip with something else? I'd prefer cream cheese or mascerpone cheese. Thanks! love love love made this for fathers day and was a major hit!!!!!!!!!!!!! I make this all the time and my recipe calls for one of the puddings to be white chocolate. Makes it a little better! Imagine that! I make this all the time and it is a crowd pleaser! The ingredients list whole milk and then "milk". Is this a mistake? If not- is it skim milk? I'm looking forward to trying these! Someone had posted this on facebook, and I since it looked good, and easy to make, I thought I'd give it a try. I made a half recipe in an 8x8 pan and my whole family LOVED it!! This is now one of my favorite desserts! I'm making a full recipe for a party this weekend; my family told me I also have to make one to leave home... Not all recipes that look good turn out to taste as good as you hope, however, this one is FABULOUS! Thanks for sharing this delicious recipe.. I'm hoping this cake is as good as everyone says. It was a pain to make. It was difficult to get the spaces all filled with pieces of graham cracker. I could have used more pudding mixture. The cocoa and powdered sugar should be sifted first. My top graham cracker layer started floating when I poured on the icing. It looks messy. Not pleased. I'll see his it goes over at my work luncheon. 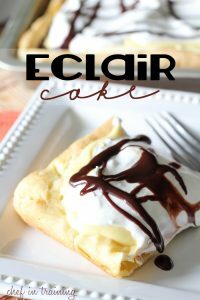 This eclair cake looks soo good! Thanks! I used to make this "cake" when my children were young. A group of us young mothers got together once a month just to chat and commerizerate and this was one of our favorites. Also a Banana Split cake that is on spendwithpennies.com. I would also like some other easy no bake recipes too! Eclair cake is my absolute favorite dessert! I am so happy to now have the recipe! The No Bake Éclair dessert, it says blend milk and pudding, but then for the frosting it does not say how much milk to use. Do I separate the 3 1/2 cups milk or use additional milk and how much? Looking forward to making this. Graham crackers are similar to English Digestive biscuits. If you want to use whipped cream in place of Cool Whip, use 1/4 C of powdered sugar (icing sugar) and a teaspoon of vanilla. There is corn starch in powdered sugar that serves to stabilize the whipped cream. Thank you!!!! I HATE HATE HATE Cool whip! Can the Eclair Cake be frozen? Loved this!! Had to blog about it - it was THAT good! Thanks! Hi ma'am ur recipes are very impressive... just want to know what is this whole milk? Sori ma'am but im not familiar with whole milk. Can u give me a better brand u are using for ur cakes. Thank u so much. Whole milk is just milk with a little more fat in it. you can use any milk you want for it. I have used skim and it turned out great! But WHY always the cool whip?????? It is an AWFUL product. REAL whipped heavy cream makes it so much better & is REAL, not whipped garbage (cool whip). I'm always looking to try new & easy recipies. 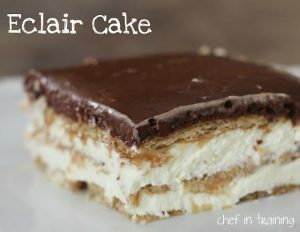 I'm going to try the eclair cake first, looks so good & easy to make. Thanks! How long do you need to refrigerate? If I made it in the morning, would it be ok for evening? I want to make it for a BBQ tomorrow, but don't have all the ingredients. Yes it would be ready for the evening serving! Hi. Was I supposed to put two layers of Graham crackers each time instead of just one layer? I only ended up using one box of Graham crackers so it didn't seem to turn out right :/ wasn't firm enough. Has this ever been made with another kind of pudding, like cheesecake, or chocolate, or french vanilla!! I always use French Vanilla. Can you make this frozen? Is the cocoa in the Eclair Cake unsweetened cocoa or is it the same kind used in making hot cocoa? Sweetened real whipped cream would be fine to use. WE have been making this in our family for years. But we make it even simpler by using canned frosting from the store. Milk chocolate or dark chocolate, whichever your family likes best. Want to make it even better? Use French Vanilla Instant Pudding instead. Otherwise, I think our recipes are the same. Such delicious looking recipes! What a shame I am over in the UK and cannot get the ingredients to try them out but it is nice to look and use imagination to savour. I have USA connections so have tasted Graham crackers and the no bake éclair cake recipe came to me via my cousin. I topped this with a ganache and it worked beautifully! Thanks! This is a good old Amish recipe. I have been making it for years. The Eclair cake looks amazing! I just saw this on Facebook and will be making this weekend! All your recipes look amazing! Thanks for some yummy desserts!!!! To all y'all that can't get graham crackers or boxed vanilla pudding, look up the recipes on the internet. I found one for the graham crackers. Calls for wheat flour, wheat bran and wheat germ. Maybe that would be a problem too. The vanilla pudding from scratch should be a lot easier. Looks so delicious, but since I have to stay away from chemicals & artificial flavorings & so on, I do not eat Cool Whip. Taste it now & taste like poison to me. Can I use real cream, somehow ? Hi, I would love to try your Eclair cake but as I live in South Africa I am not sure what Cool Whip is. It's sounds to me what our Orly Whip is ~ an artificial cream ~ in liquid form. If it is do you beat it up first before adding it to the vanilla pudding. It pains me to think how many calories this has in it. I avoid Cool Whip. Read the ingredients. You wrote 2 instant vanilla pudding . did you meant 2 packets of it please. I make this using French vanilla pudding. For the frosting I use a can of ready made chocolate frosting. Microwave about 10-15 seconds for easy spreading. Yummy! The Eclair Cake is wonderful. I get requests to make it for every family get together. Love love love it. It is nice to prepare with my nieces. Awesome Eclair cake. Has become my most requested dessert for family get dinners. Love it!!!!! can this be lightened up with sugar free pudding, skim milk, etc? Hi just wondering if you can use Sao biscuits or what other biscuits can I use I'm a cook in nursing home and limited budget this would be a change for them and I have done similar just with sponge underneath Thank you. Can i use homemade custard instead of the instant pudding? You can use the tub of store bought frosting....microwave for 30 seconds. It will thicken back up while refrigerated. Much easier than trying to frost the crackers!! I use canned whipped icing when I'm in a hurry. Hi! Re the Eclair cake. You mention a 9x13 pan. Is that inches? We here in South Africa work in cms so not sure! I make this dessert basically the same except I use a can of milk chocolate frosting for the top. Just microwave until pouring consistency. Best dessert I think I've ever had!! Can't make too often or I'd be in trouble lol. What about topping it with hot fudge ice cream topping? Made this for a party and it was a huge hit!!!! is cool whip the same as whipp d cream in a can. And what do we use instead of graham biscuits. Not sure what they are. Live in Melbourne Australia. The only thing missing is WHAT SIZE PAN?!?!? How easy (or not) is it to cut? Won't the filling just spill out? It did not spill out for me. When you let is sit overnight, it firms up and is super easy to cut and dish out. I used a spatula and it was perfect! If anyone is using the fake whipped cream cool whip, which to your body is like eating styrofoam, and is using packaged pudding mix, and is using a microwave, they have no right to call themselves a chef. Use real ingredients! Hi, just curious I am an Australian and I don't have any idea what cool whip and powdered sugar are ????? I use French Vanilla pudding,,,gives it a better flavor. It looks delicious...but for people that can't have dairy...we can only look! I wish there were more amazing recipes like this but dairy free!!! Can this be made with real whipped cream. Cool Whip is disgusting. Made this for Christmas and it was amazing! My whole family devoured it. I doubled the frosting like you suggested and used Dark Cocoa Powder! So yummy! Thank you for a great recipe! This turned out really well. Everyone loved it. It calls for 2 boxes of graham crackers and I didn't even use 1 full box for a 13 X 9 pyrex pan. Maybe the recipe allows for some of the crackers being broken or a pan without curved corners. I would definitely make it again and double the chocolate frosting. I'm wondering the same thing! Only used 1/2 of one box??? I was wondering if the graham crackers could be put in a blender with some butter, little bit of brown sugar and a little bit of vanilla. Put a layers inthe bottom of the pan, pushing it down. then for the next layer sprinkle on the remaining graham cracker mixture. I was thinking cutting the graham cracker whole would not be easy. What are graham crackers? Are they like lattice biscuits? Can't stand cool whip, can I use whipping cream instead? Wat is cool whip in the éclairs? HI IM LIVING IN IRELAND AND SOME OF THE INGREDIENTS ARE NOT AVAILABLE ,IE GRAM CRACKERS ,VANILLA PUDDING MIX HAT CAN I USE INSTEAD ? I'm probably getting too literal here but the recipe calls for the milk and pudding to be "blended" for two minutes. I'm assuming this should be done in the blender? I'm confused about the amount of graham crackers - I made this and only needed 1/2 of one box. Recipe calls for 2 boxes??? 1. What is vanilla instant pudding and what is a substitute for this? 2. Whole Milk - I'm assuming this is full cream milk? 3. Cool whip - I've read that its whipped cream in a can or the fresh cream that you whip yourself. 4. What is graham crackers and what is a substitute for this? Instead of using milk and cool whip, try coconut milk and whip up some coconut cream instead of cool whip. I can't believe how many people are asking the same questions!!! "What is Kool Whip and what are Graham crackers?". This has been answered I don't know how many times. Why don't you just take some time to read through the comments?? Other than that, I think the recipe looks great and I will try it - with fresh whipped cream of course. No substitutes in our house! This is the first time I have used this site and had no idea there had been people asking the same question ! No need to be so rude . It would be more helpful if the ingredients listed gave an alternative ! Do you use salted or unsalted butter? Does it matter? Could you come up,with a healthier version, one that does not use cool whip or boxed pudding mix? For people that are trying to combine good taste with nutrition, this is not good. Made this for Easter dessert and it was absolutely amazing! Definitely a huge hit and by far one of the best desserts i have made. I also doubled the chocolate topping even before reading that you did it!. I make this all the time and for diabetics, you can use the sugar free pudding and then they can have this treat also! I would substitute cool whip with the real stuff. It does look yummy. Came across your sight while looking at an old friends site from Lamesa, Texas. I live to cook and can't wait to try your Eclair Cake. We have a Brunch at our church every month September- May and this looks like a recipe we could use. Thank you for sharing and Happy Chefing! I can only find Jello instant vanilla pudding - how can I change to to be like French Vanilla? Can I substitute another milk (soy or rice)? We don't get Cool Whip in South Africa, but we do get Orley Whip which I presume is the same thing. My hubby detests it, so would normal whipped cream substitute? What substitutes pudding mix? I may not find it here in the Philippines. I live in Greece. Can’t find cool whip. What can I use as a substitute? Can you get graham crackers in Australia? I see a lot of recipes that use graham crackers on here. What would be a good substitute?that I can get in Australia? Hi I am in England do you know an equivalent to Vanilla Instant Pudding mix, cool whip, and graham crackers or give me a description of what they are so I can try and find an equivalent, I would so like to make this recipe. I have christening coming up and this would so be a tasty treat. Thank you in advance for your response. I am a Srilankan.Here in Sri Lanka, we don't have vanilla pudding mix.Is there a substitute? This looks so yummy, but some ingredients are not available.Please specify.Thank you. Hi im in South Africa, what is equivalent to graham crackers and what is powdered sugar. I only used one package of graham crackers and doubled the icing recipe. SUPER yummy! 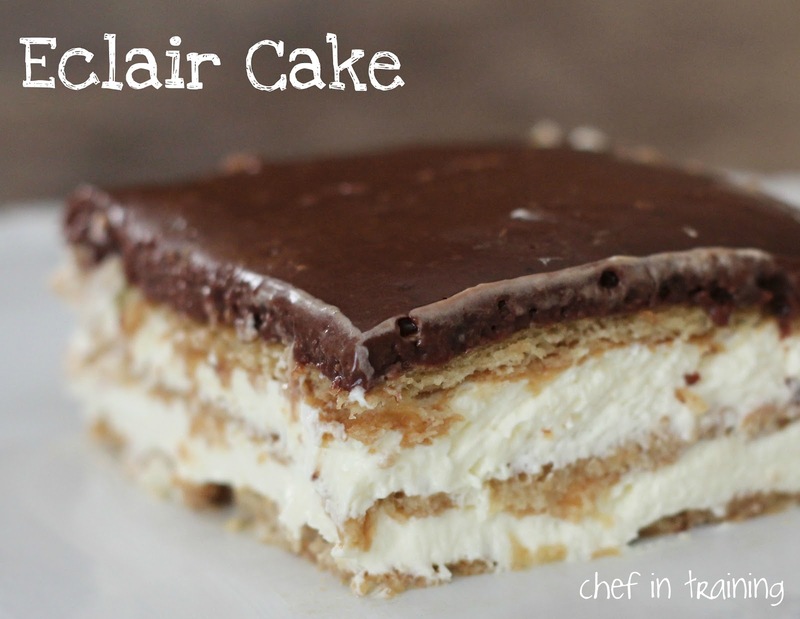 I would love to try this delicious Eclair Cake, as I live in Australia some products are named a little different, could you please tell me What Cool Whip is, Grahmes Crackers, are they like a sweet biscuit, Powdered Sugar, would this be icing sugar??? The Eclair Cake is FABULOUS! Everyone has asked for the recipe. I've never heard of Cool Whip, but as I live in New Zealand it may not be available here. Can you suggest an alternitive or tell me exactly what it is so I might be able to come up with something to substitute for it, please? I was reading the comments below and had not noticed that you also changed the amount of milk? and the amount of cool whip- did it make the pudding heavier? I just made the old recipe last night before I decided to print it out for friends and then discovered it had been changed- what will the difference be overall- thanks- BTW-- everyone RAVED over it!! can I substitute real pudding for instant? This is truly a delicious recipe. I have made it twice and get compliments and requests for the recipe constantly. You only need 1 box of Graham crackers!!! Made vanilla eclair pie, it had just the right amount of sweetness. For Frosting, can you use a can frosting, Choc. Is there a substitute I can use for the milk? For a dairy-free option? Just wondering what it cool whip. Will Marie plain biscuits do. Thank you for the eclair recipe. This recipe was amazing!! Just made it for the 4th of July. Easy and it really does taste like an eclair. This is in my save pile. Would be awesome for a potluck! I want to make this for a party but don't have access to a refrigerator at the venue so it will sit out for approx 5 hours. Will that work or does it need to be kept cold?? Over all this recipe's taste was good but other then that I believe there were some steps left out. I made this recipe exactly how it says to and 2 days later I took it out of the refrigerator for a birthday we cut it open and it was very runny. Something needs to be changed with this recipe! First make sure you make the pudding as it says on the box and let it set before doing anything else! Once the pudding is set and solid then fold in the cool whip make sure it's cold then layer your cake. Thanks for the idea anyways.